The St. Olaf Christmas Festival is a concert performance that has become one of the nation's most cherished holiday celebrations. Started in 1912 by F. Melius Christiansen, founder of the St. Olaf College Music Department, the festival  which takes place at the college in Northfield, Minn.  includes hymns, carols, choral works and orchestral selections celebrating the Nativity and featuring more than 500 student musicians in five choirs and the St. Olaf Orchestra. 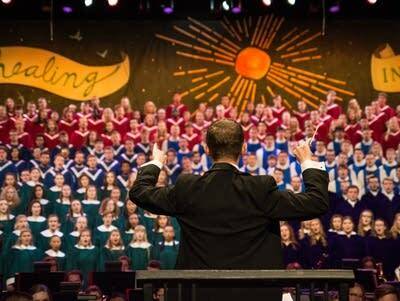 This year's festival features the St. Olaf Choir, the St. Olaf Orchestra, the St. Olaf Cantorei, the St. Olaf Chapel Choir, the Manitou Singers and the Viking Chorus, performing as individual groups and as a massed ensemble. To download video and audio of the St. Olaf Christmas Festival, visit the college's Download Center. Gloria Shayne/Simeone, Waring and Ferguson (arr. ): Do You Hear What I Hear? For more information, consult the full concert program. Audio produced in cooperation with Minnesota Public Radio and sponsored in part by Tad and Cindy Piper.